The biggest challenge on policy front is the fight against the perception that a small number of big corporations do cosy deals with the government, Planning Commission Deputy Chairman Montek Singh Ahulwalia has said. He also said the new government after elections will get a considerable time during which whatever initiatives it wants to take will not be questioned. But probably 6-8 months down the line the honeymoon period will be over and all the issues will come up again, he warned, even as he said "a broad continuation" of policies will give better results as there is a surprising amount of overlap in what the two major political parties want. "From the policy point of view, the biggest thing we have to fight against is the perception that a small number of big companies do cosy deals with the government. Along with the revolution of rising expectations, there is a global distrust of governments all over the world. We suffer from that too," Ahluwalia said addressing India business conference at the Columbia Business School. His comments come in the backdrop of allegations of crony capitalism flying thick and fast. It may be noted that AAP leader Arvind Kejriwal during his 49-day tenure as the Delhi Chief Minister had ordered CAG audit of power discoms and initiated action against Reliance Industries and Oil Minister Veerappa Moily in February charging them with complicity in fixing gas prices. Ahluwalia said that "messages" coming out from all major political parties ahead of and during national elections is that there is keenness to restore investor confidence, no rollback and confidence that India can do well in a global integrated economy. "I personally think that those will be the policies that will be put in place," he said. "If you look at the manifestos of the two major parties, there is a surprising amount of overlap in what they want. Everybody seems to want growth, wants to be inclusive, (realise that) infrastructure is important, we need to do more in education," he said. He said while any new government would make improvements and alterations in political and economic policies, "a broad continuation of these policies will actually produce a better results". Ahluwalia said a 7-8 per cent growth would not be impossible if pending policies are implemented by the new government after the elections. "The growth rate has bottomed out and I do think there will be an upturn. What we are seeing at the moment is a slowing down of India's growth rate at about 5 per cent for the last two years and a general feeling that the growth rate is going to pick up in the year ahead," he said on last Friday. 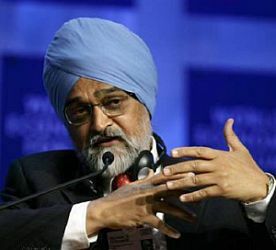 Appearing on a video link, Ahluwalia told faculty, students and entrepreneurs attending the day-long conference that in the year ahead both the global and the Indian economy "is actually going to look a lot better". "Simply because we know the global economy has turned around. On the whole people think that the global economy will be reasonably well managed." "On the Indian side, after the elections I expect to see a substantial reduction of tail-risk assessment," he said adding that there is a "general agreement" that growth in India will show an upturn next year. "The new government will get a significant period when whatever initiatives it wants to take will not be questioned. But probably 6-8 months down the line the honeymoon period will be over and all the issues will come up again. "In these 6-8 months, if a large number of things that are pending are got done, we will have produced an environment in which gradually getting back to some kind of growth between 7-8 per cent would not be impossible," he said. Ahluwalia also said India is not nearly on the medium and long-term growth path of 9 per cent growth that it had envisaged for itself. Looking at the overall slowdown in global economy, India had to scale down its expectation, he added. He noted that there are a number of policies in the pipeline for which there is enough political support but the fact that they are being delayed is "unfortunate". He cited the Goods and Services Tax, which is "extremely important" tax reform, and hoped that the new government will take steps to implement it. He said one of the unwritten stories about India is the "extraordinary degree of creativity" dispersed in very large number of companies across the country. The widespread opportunity in India to be innovative will make a difference between India getting back from the 5 per cent growth of the last couple of years to hopefully seven per cent. He expressed hope that the new government would also give "high priority" to ease of doing business in the country. "We are not asking the question how we can it easier for foreigners to do business (in India). (We are) asking how can we make it easier for any investor to do business," he said adding that India is not engaging in top down planning.